This city of 1.4 million people is a heaven for businesses! There's no corporate tax (except for oil producing companies and branches of foreign banks) … no personal income tax … no capital gains taxes … and no withholding taxes. Plus, there are no foreign exchange controls, quotas or trade barriers. The UAE's currency, the dirham, is freely tradeable and linked to the U.S. dollar. Per-capita GDP is well over $30,000 … the highest in the Middle East and up there with the world's top 25 economies. Dubai is the world's fastest-growing tourist destination, with nearly six million visitors in 2006, and 15 million expected by 2010. The richest ones stay at the only seven-star hotel in the world, the famous Burj Al Arab, where one night costs more than $1,500. The Burj Dubai Tower: This, the most ambitious skyscraper in history, will reach as high as 800 meters (2,624 feet) when complete. That's a whopping 300 meters higher than 101 Taipei, the tallest building in the world right now! Dubailand: Set to become the most ambitious tourist destination ever created, Dubailand will be more than twice the size of the Walt Disney World Resort in Florida. This mega-project theme park will cover three billion square feet! The Dubai Mall: When completed, this will be the largest mall in the world, with more than 1,000 stores spread over two million square feet of retail shopping space. 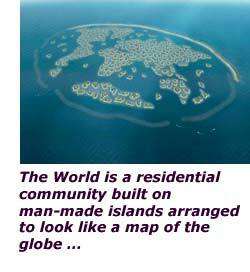 There's also something like $100 billion in residential developments going up, including hundreds of man-made islands in the shape of palm trees and one project called "The World," which is an entire seascape of man-made islands arranged to look like a map of the world. Dubai's boom is being driven by oil money, and an international gang of the rich and famous who are seeking a Middle Eastern paradise on the Persian Gulf. In short, there's a big divide between what's happening in Dubai and the needs and desires of the resident masses. What I'm seeing in Dubai differs dramatically from the events taking place in China, India or almost anywhere else in Asia. In those places, billions of people are just emerging from poverty. Here in Dubai, most people, including the working class, are already relatively well off. "There's way too much construction going on." As I said, most of the money building up Dubai is directly or indirectly oil money. It's as if the ruling party in Dubai (the Maktoum royal family), and other wealthy groups within the UAE, have nothing better to do with their money but spend, spend, spend. They say they're aiming to diversify their economy away from oil revenues and into other forms of trade and tourism, but I have to wonder about their decisions. To me, it looks like there's a lot of ego going into the projects here. I see wasteful spending, and big bets that a huge future is in the offing. Mind you, I've enjoyed my stay here in Dubai. The climate is spectacular, the city breathtakingly clean, the people wonderful. But there seems to be a big gulf between the rich and the not-so-rich in Dubai, and that worries me. They're not on the same page. Contrast that with many parts of Asia, where the masses want to get rich, and the leaders are providing the means to do so. Dubai's Gold Souk, an open-air market that contains some 500 gold shops, is the largest retail gold market in the world. An estimated 500 metric tonnes of gold, or nearly 18 million ounces, are bought and sold each year. 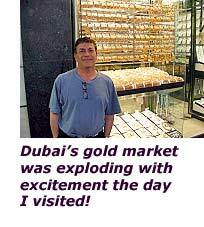 But here's the most important point: In the gold souks of Dubai, both the ultra-rich and regular citizens are buying gold. I watched wealthy businessmen, construction workers, and imams all snatching up the yellow metal. 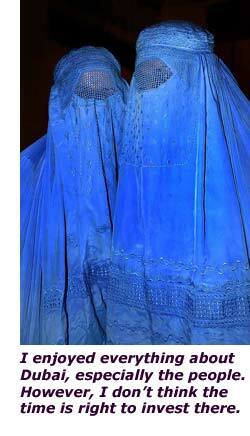 When I spoke with two Muslim women covered head-to-toe in their blue burqas, one of them said, "Gold never goes out of style, whether it's jewelry or bars. It's really money." I couldn't have said it better, nor could I have met a more gracious lady. It's rare for a devout Muslim woman to even acknowledge a strange man trying to talk to her, but she even took that picture of me in front of the gold shop when I asked her to. I will visit Dubai again, perhaps next year. But if there's one conclusion I arrived at during my visit here, it's that I wouldn't make any big bets on the area. There's no doubt that it's booming, but the funding is coming from the richest of the rich, and the projects are mainly for the rich. They are not backed by demand from billions of people. I Wouldn't Bet on Dubai, But I Would Bet On Gold! Gold's recent performance has been terrific — it hit $673 last week, before falling back to $665. Right now, I expect it to enter a new choppy trading range between $645 and $670, lasting perhaps as long as another week. But don't let that bother you. In fact, consider buying on the dips! As long as the price of the precious yellow metal holds $610 on a closing basis, then gold's next leg up is still forming. And I fully expect to see it back above $732 an ounce, its highest level in 27 years. And then there's the Iran situation. I'm sitting here in my hotel room, looking at the Persian Gulf, the coastline of Iran just 100 miles away. While I feel safe here in Dubai, I believe the Iran nuclear crisis is far from over. In fact, I expect it to soon go full tilt, especially after the recent Iranian detention of 15 British naval troops. Bottom line: If you don't own any gold, now looks like a good time to buy some. And one of the easiest ways to do so is the streetTRACKS Gold ETF (GLD).